This one got me stunned for a while especially as I started of with the wrong check. Could you say from whom it is for my database? After some time comes the realisation that the black king can be driven to the excellent mating square on h5, since he can`t go to f8,g8,h8 or f7 because white could queen with impunity. Here it becomes obvious that King and bishop might mate, so the queen is not needed. 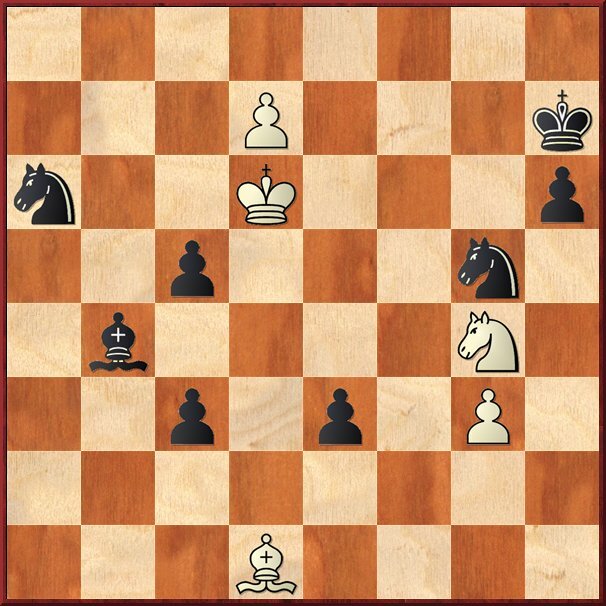 This is where it suddenly became amazing, black has 2 under-promotions to delay the mate, though the lines are pretty forced, I kept wondering how the bishop would end-up finding a mating square through the cavalry's charges. It would have been totally impossible form me to find it without moving the pieces. The intro sacs (knight and queen) to get to a mating net where to tempting not to try, but the bishop's subsequent moves are amazing. Time to look at the other 'studies'. The one with black to move looked like a simple game combo though with a rook sac on b6, followed by the knight sac to push the pawn. "There is an obscure mythology about the puzzle’s provenance. I think Graham Hillyard was the first person to show it to me, in 1986, or earlier. The study appears in Gufeld’s last book, The Search for Mona Lisa. His story is that it pops up circa 1990. There are stories of Tal having received an anonymous letter, pre 1986, of a lorry driver having composed it. Gufeld says that since nobody has yet claimed to be the inventor of the study, he proposes that it dropped in from outer space. I am sure I read somewhere that sombody ending in -shvili did it. He says that during the 1992 Olympiad the Malaysian the player MokTze Meng received an anonymous phone call saying that here was a gift for Gufeld – and the voice then dictated the position. Gufeld says that at the 1992 Olympiad both Karpov and Kasparov were amazed by the study." But there are also stories about Tal seeing the position in Brussels in April 1987, not being able to solve it and then suddenly coming back, from a 10 minutes walk in the park, to the press center with the solution. In the database the author of the problem is given as G. van Breukelen, and the place of publication as the Dutch magazine Schakend Nederland. Most baffling was the date: 1990. What about the position being showed to Tal in 1987?! Obviously the best strategy is to contact the leading endgame expert, Harold van den Heijden himself: "My conclusion is that Gijs van Breukelen composed the study in the 1970s and showed it to a couple of friends. Later, in 1990, van Breukelen decided to publish the study in the magazine Schakend Nederland." Another endgame expert, Roycroft concludes the same: "The composer of this fine study is the Dutch composer Gijs van Breukelen, who demonstrated it as an example of his own work at a meeting of ARVES held in 1992 in Delft. The position with the author’s name was already in Schakend Nederland of iii1990 as an original. The composer said at the ARVES meeting that he had composed it in the mid-1970s and shown it to several friends, but had neither sent it for publication nor entered it for a tourney. Having somehow penetrated the player circuit it circulated rapidly, acquiring journalistic colour en route though being associated either with a (totally fictitious) Ukrainian tractor-driver, or with a very specific (but equally spurious) game between leading masters. The late IGM Tal was one of the active propagators, but when asked he claimed he could not remember who had first shown it to him." The story is more mundane than one might think / hope. The study is 100% by Gijs van Breukelen, who showed it to his good friend Guus Rol (at the time also a composer of great chess problems. Especially retrograde problems). He in turn showed it to me and another bunch of chess players in the chess-cafe in Utrecht around 1980. Some years later (1982-1985? ), I'm almost sure I showed it to Plaskett and some other people who happened to be standing around the table, in either the Jersey or Guernsey chess tournament. I can't imagine why it took Gijs van Breukelen so long to officially publish this absolutely brilliant study. That's what I found about the provenience of this study. Good luck with the others! Usually do not waste products your hard earned dollars at a pretend phony fashionable designer purse or simply backpack! The fact that substantial financial commitment tag heuer replica sale everyone come up with $200-$800 from a pretend fashionable designer purse or simply backpack will often be useless. Whenever you might get hold of different backpack, select an item for valuation, not cheap imitations. AT ALL TIMES demand a good refund policy! So why worldwide will someone chanel replica sale want to buy a good pretend fashionable designer purse or simply poor quality? We won't be able to have an understanding of expending superior revenue two hundred thousand dollar pretend fashionable backpack. Isn't going to quite possibly learn to understand to my advice, regardless if any backpack seems the real thing. At the time you fully understand it's not at all realistic - so why take the trouble? Most of all, don't forget this purchasing phony product or service is certainly criminal, span. Phony fashionable object provides a sub-culture most of some. I will be not certain whenever consumers tag heuer replica sale utilize the inescapable fact they're just becoming an item resembling the real thing for lower cost, or simply if he or she basically do not understand necessary to resist, stability together with valuation for realistic fashionable shopping bags from the get go. That i get laughs there these days, however , pre-internet, any phony designer purse investing in progression came across as classy terraces together with unusual. It all were feeling because which you were someway happy that will find out how to shop for those abnormal commodities.